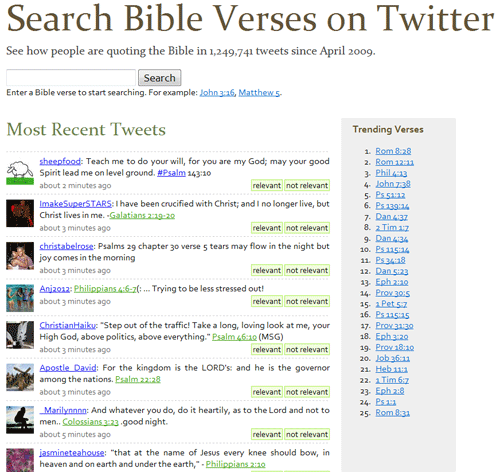 Search over 1.2 million Bible verses on Twitter–nearly every tweet that has mentioned a Bible verse since April 2009. You can also see a list of the most popular verses on Twitter over the past few hours (“Trending Verses”). This project uses several APIs from Twitter and is still in a beta stage. It could evolve in several directions, but I want to see how people use it before developing it further. It’s not quite realtime, but the most recent tweet is rarely more than a few minutes old. It currently uses Logos RefTagger to link the Bible references in the tweets. Feel free to leave a comment here if you have a feature idea or want to make any suggestions. Edit February 2016: This feature is no longer available; with over 200 million tweets, it’s just too much data to serve reliably. Instead, the latest tweets are visible. You are currently browsing the OpenBible.info Blog blog archives for November, 2009.